In the real world, Hello Kitty was born in Japan in 1974, when a young Tokyo-based company called Sanrio asked designer Ikuko Shimizu to invent a cartoon animal who would appeal to the preteen girl in everyone. Sanrio, which already had a bear and a dog (and, curiously, a strawberry) in its growing cast of characters, needed the new critter to decorate a plastic coin purse it was planning to produce. Shimizu "wanted to create a cat that was kittenish for sure," author Marie Y. Moss writes in the book Hello Kitty Hello Everything, "but one that would certainly prefer a catnap to catnip." And so the designer drafted a white cat wearing a red bow and blue overalls. On November 1, 1974, Sanrio introduced the first picture of Hello Kitty. She sat between a bottle of milk and a pet goldfish, and had turned her head sideways to face her newfound friends. In a word: cute. Or more accurately, kawaii, the distinctively Japanese breed of cuteness that injects adorable attributes into all aspects of the country's consumer culture. In her own make-believe world, however, Hello Kitty isn't even Japanese. She lives in the suburbs outside London with her father, George White; mother, Mary White; and twin sister, Mimmy White. 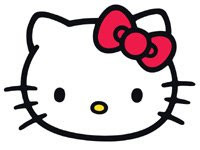 Yes, Hello Kitty is a nickname; her birth certificate reads Kitty White. How to tell Kitty and Mimmy apart? Look at the bow. Hello Kitty prefers a red bow in her left ear; Mimmy opts for yellow on her right. Other occupants of the White house include Bear, apparently a living teddy, and Moley, who pops up in the garden. Sanrio located the Whites in England as a nod to the surging Anglophilia of 1970s Japan, notably the books and illustrations of Beatrix Potter (The Tale of Peter Rabbit) and Lewis Carroll (Alice Through the Looking Glass). Much has been made of Hello Kitty's mouth, or lack thereof. A handful of feminist scholars say her noncommunicative nature perpetuates the submissive female archetype, while others attribute Hello Kitty's appeal to her blank stare -- onto which fans can project their own emotions. According to Hello Kitty's official bio on Sanrio's website, "Kitty is a cheerful, warm-hearted little girl. Baking cookies is her forte, but what she enjoys most is eating a slice of Mama's apple pie!" We also learn that her favorite things include candy, stars, and goldfish, as well as the inevitable "small, cute things." Hello Kitty is in third grade. She weighs the same as three apples and stands five apples tall. Her blood type is A.
Hello Kitty turned 30 in 2004, and although in her world she remains a kitten, her Earthly reality continues to grow. In 1993, Sanrio introduced a boyfriend for her, a similar-looking kitty named Dear Daniel. The two playmates rarely rendezvous, however, because Daniel is perpetually on African safari with his family (dad is a photographer). No worries, correspondence is a Hello Kitty mainstay, hence her fondness for stationery. Other members of her social circle include the teen bunny Kathy, brother and sister monkeys Timmy and Tammy, and boy puppy Jody. In 1976, Setsuko Yonekubo became Hello Kitty's second chief designer. She was in turn replaced in 1980 by Yuko Yamaguchi, who remains at the helm. In 2004, Yamaguchi explained the long-standing appeal of her charge to London's Times newspaper: "Hello Kitty can wear Laura Ashley but also punk rock leather. She has a wide audience, and she's very flexible because everything goes with white." Hello kitty is a cute cat that everyone loves espically the dark versions of hello kitty. tak sangka hello kitty dh bnyk gak usia dia kan?but still maintain cute until now..
destroyhellokitty.blogspot.com is very informative. The article is very professionally written. I enjoy reading destroyhellokitty.blogspot.com every day.